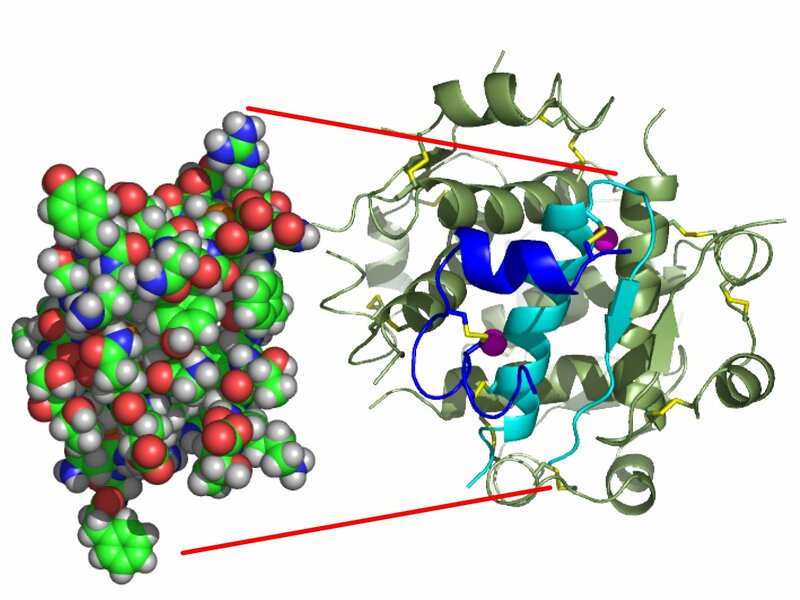 30-second video of protein folding. The goal is to present dimensions of data, sonically, that are orthogonal to the animated computer model on the right. In the middle are shown three graphs representing different dimensions of data not portrayed by the video animation. 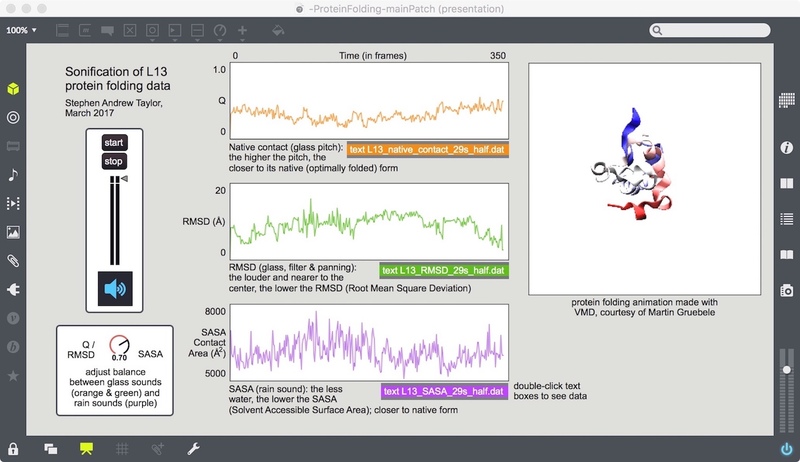 Download the Max patch (updated June 26, 2017 - now you can control the playback speed interactively), and an accompanying paper for the International Community for Auditory Display (ICAD). 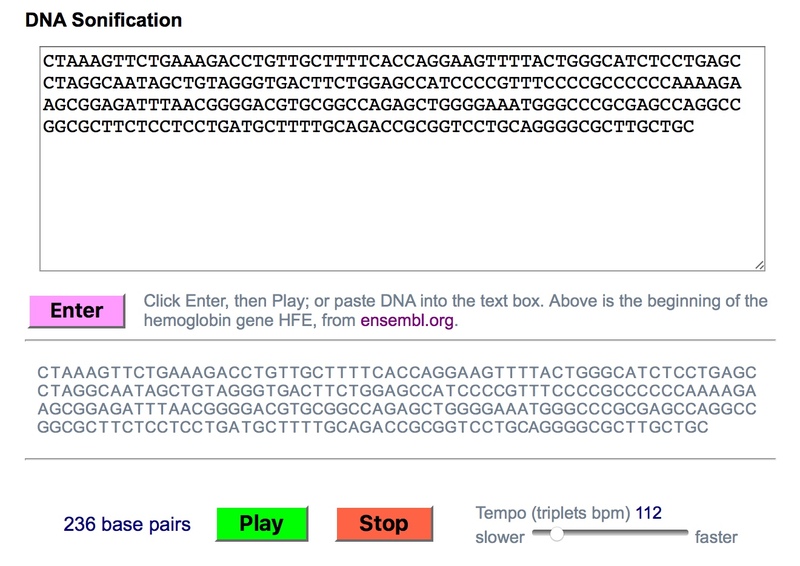 Make your own sonification of any gene or length of DNA. Detailed explanation of sonification techniques used in Indian Hedgehog and other pieces. Premiere: 28 February 2017, Urbana, Illinois. 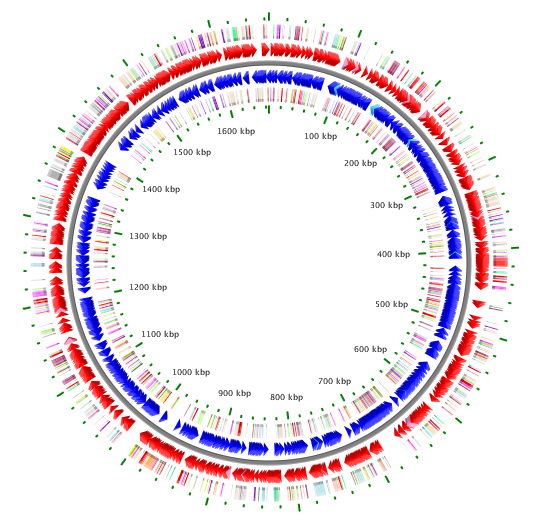 An interactive website where you can explore the circular chromosome of the archaea Methanococcus jannaschii. In 1996, Carl Woese and a team of researchers at the University of Illinois published M. jannaschii's complete genome, the first archaea to be sequenced. This news bureau article has more information about the piece. Premiere: 12 July 2015, Strasbourg, France. Debra Richtmeyer, saxophone. Indian Hedgehog is a sonification of the gene Indian Hedgehog (IHH), which helps to tell our limbs and digits where they should go as we develop in the womb. In the electronics we can hear the complete gene, over 8000 chemical "letters" of DNA (you can find more information at Sonification of DNA & Amino Acids). 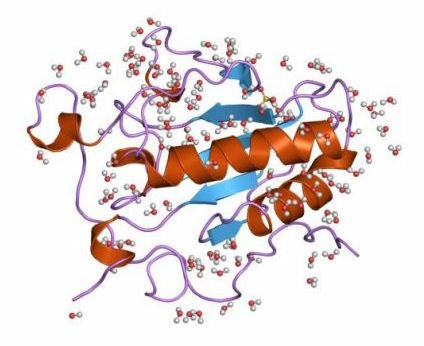 The complete gene consists of three exons (which code for amino acids to make a protein) and two longer introns (informally known as "junk" DNA), in which the tempo gets much faster. These contrasting tempos make the overall form of the piece, quasi ABABA. Over this sonification, the saxophonist plays different motives and figures which represent the secondary structure of the IHH protein, shown in the picture above: alpha helices are long, soaring tones, while beta sheets are syncopated, rhythmic figures; turns and coils are arabesques. During the fast intron sections, the saxophone plays much more freely. These are the parts of the piece where I have the freedom to do what I want! Here are the first five minutes of the piece; in this excerpt we hear the first exon and part of the first intron. Your browser does not support the audio element. To make the electronics, I wrote a program in SuperCollider which sonifies sequences of DNA, and combined it with sounds produced by the Kyma system, a formidable synthesizer made by Symbolic Sound. The work is dedicated with gratitude and appreciation to Debra Richtmeyer, who generously provided expert saxophone help as I was composing. A simple theme played in octaves represents a primitive gene. Tiktaalik, the subject of variation III. Premiere: 13 October 2015, New York City. Ian Hobson, piano; New York Times review. Variations Ascending is part of an ongoing project of mine, to turn DNA into music. Sometimes I transform genetic information directly to musical sound; sometimes the process is more free, like the impressionist Debussy composing music for the sea. Many writers on genetics can't resist the metaphor of a gene as a kind of musical theme, upon which evolution works a never-ending series of variations. After encountering this idea over and over again, I thought to myself, why not go the other way around? My theme, a simple melody played in octaves, is a stylized representation of a gene--specifically, Sonic Hedgehog, an ancient gene responsible for the layout of all vertebrates' limbs, which is also the subject of my 2014 piece Sonic Hedgehog. Among other things, SHH determines where our fingers should go (which I think makes it a good candidate for the piano). As we progress through each variation, this musical "gene" evolves, with all its motives, rhythms, and implied harmonies. The title is inspired by biochemist Nick Lane's book Life Ascending. As we dig into the earth we burrow deep into time. You could imagine this piece beginning at the foot of a cliff full of fossils, gradually climbing up through life's history as we approach the summit, where we meet ourselves. But ultimately it is a piece of music: it has as much to do with biology as La Mer does with oceanography. This set of variations--a rich and ancient musical form--is dedicated with gratitude and admiration to Ian Hobson. I am grateful to the Guggenheim Foundation for providing the time to work on this project. Variation I - the Cambrian explosion, 500 million years ago. After billions of years of single-cell life, a fantastic array of creatures suddenly spring into existence in the fossil record. Variation II - the Devonian, or "age of fishes," 420 million years ago. The ocean was full of life, but the land was mostly barren. Variation III - Tiktaalik, the fish with limbs, 375 million years ago. This is the first known tetrapod fish: its fins were like limbs that could crawl. As its discoverer Neil Shubin says, it could do pushups. Here the theme is inverted, a nod to mirror symmetry; in one spot the theme appears in a four-voice canon in inversion. Variation IV - Ascent to land; the Permian, 290 million years ago. This was one of the greatest flourishings in Earth's history: no mammals or birds yet, but the land was full of amphibians and reptiles, and everywhere was green. Variation V - the Permian extinction, 250 million years ago. The most terrible event in the history of life: we estimate that 95% of all living things went extinct, from a combination of horrific climate change and millions of years of volcanic eruptions. A hellscape: the theme regresses backwards, ending in the lowest register. Variation VI - the Triassic; origin of mammals, 200 million years ago. The world still suffocated in the aftermath of the great extinction. Sea level had only as much oxygen as Mount Everest does today. Our first ancestors gasped for air in the muck and slime, struggling to survive. The theme is turned upside down and backwards (retrograde inversion). Variation VII - the Cretaceous, 65 million years ago. Tiny mammals and birds under the dinosaur hegemony, which ended abruptly with a massive asteroid impact. Variation VIII - the Paleocene, 55 million years ago. Lemurs, tarsiers and other primates, living in the trees. A trill variation. Variation IX - the Pliocene, 5 million years ago. Chimpanzees vs. Bonobos: our closest relatives are both violent and peaceful. Variation X - Homo sapiens: a fugato inspired by the human brain, with its potential for love or hate, reason or madness. Premiere: 13-14 November 2014, New York City. Stony Brook Contemporary Chamber Players, Eduadro Leandro, conductor. Writhe is based on a tiny organism called Archaeoglobus fulgidus, an extremophile--literally, "lover of extremes" (my working title for this piece, with apologies to John Coltrane, was "A Love Extreme"). This single-cell creature lives in superheated environments, like the hot springs of Yellowstone. 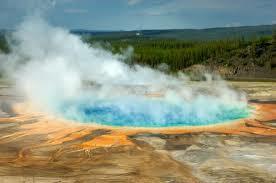 Within its genome is one protein, reverse gyrase, which is found only in extremophiles; no other living thing has it. The job of reverse gyrase is to keep DNA from denaturing in the extreme heat--a microscopic, Sisyphean task, both heroic and tragic. "Writhe," a term from knot theory, refers to twists and coils in DNA; reverse gyrase controls the writhe of its DNA. For a couple of years I've been working on a series of sonification projects based on genetics, turning DNA into music. Since a complete genome, even for a microscopic organism, is very long, my work has focused on single genes and proteins (which are coded for by a gene's DNA). Even so, reverse gyrase contains over 1,000 amino acids; this piece sets about half of them, in a kind of text setting. Instead of lyrics, the text is a long chain of amino acids, which begins MAVNSKYHHSCINCGGLNTDERNERG... This is part of a motif known as a zinc finger. The piece is formed from this and other motifs--alpha helices, beta sheets, turns, etc. The resulting music creates a sort of portrait of the protein; but it doesn't depict what the protein actually does. So the coda of Writhe, with live electronics, imagines this tiny mechanism in motion, continually winding DNA back together as it keeps denaturing in the endless, roiling heat. Premiere: 20 August 2014, Krakow, Poland. Michael Cameron, doublebass. 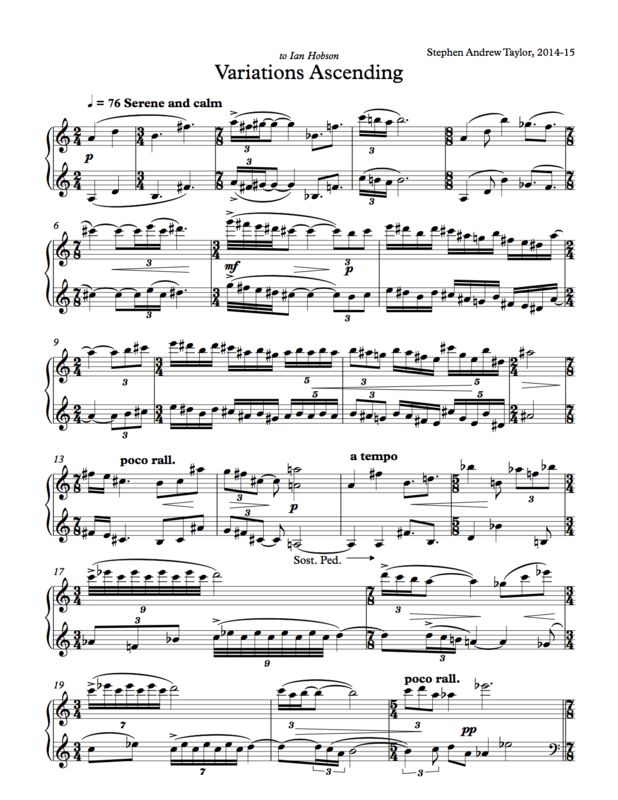 Version for cello premiered by Kivie Cahn-Lipman, 17 November 2014, New York City. Kinesin is one of the transport proteins within a cell; here is a fun video from Utrecht showing it in action. This piece represents a small part of the kinesin protein (each of its 45 bars is one amino acid), which "walks" along tiny tracks inside each of your cells. This is a kind of "walking bass" piece; you can jazz it up a little. Premiere: 24 July 2014, Sydney, Australia. Jonathan Keeble, flute; Ann Yeung, harp. Sonic Hedgehog belongs to a series of pieces I'm composing as a kind of 21st-century "program music." Instead of seeking inspiration from the sea, or thunderstorms, these pieces attempt to sonify DNA and genetic data. The protein sonic hedgehog tells our limbs and digits where they should go as we develop in the womb. In this piece you can hear the DNA sequence for sonic hedgehog played in the electronic hi-hats, while the flute and harp play melodies and canons modeled on the spiraling alpha helixes and driving beta sheets that form the protein. Premiere: 11 July 2015, Strasbourg, France. Quadrivium Quartet: Chris Anderson, Nathan Mandel, Pin-Hua Chen, and Jennifer Klauda Anderson. 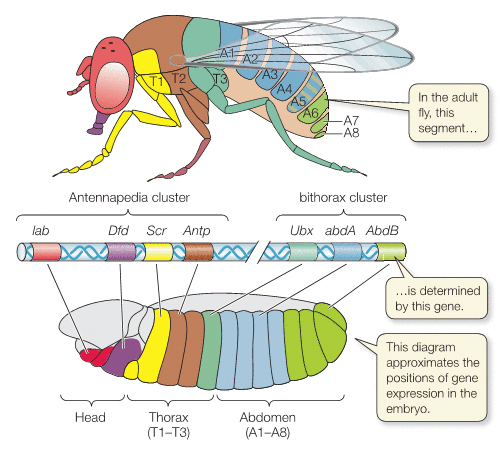 The ancient gene Hox, found in everything from people to houseflies to sea cucumbers, has the crucial job of telling where to put our heads and our tails. This saxophone quartet is in three parts: the first, "Homeobox," is the original section of the gene, conserved across millions of years; homeobox refers to a succession of DNA (the box) that stays the same (homeo). The rhythms are sonifications of each of the four bases (CATG), while the harmonies represent the amino acids that the DNA encodes; these amino acids form the Hox protein. In the second movement, "Helix turn helix," melodies and canons are based on a part of this protein whose job is to latch onto DNA (here, fast descending scales) and unwind it, so its instructions can be read by other genes. Finally, the last movement, "From head to tail" is an impression of this gene doing its job: at first, its melodic gestures start only to end in dissolution. But gradually, the end (or tail) becomes more forceful, and the piece ends with a group of chords that grow more and more emphatic. "From head to tail", performed by the Quadrivium Quartet (2:54):	Your browser does not support the audio element. Premiere: 30 April 2013, Los Angeles. Piano Spheres concert series: Gloria Cheng, harpsichord. Ubiquitin is a tiny protein that appears in nearly every multi-celled creature on Earth: since it marks parts of cells to be recycled, one of its nicknames is "angel of death" (this sinister connotation works well with the harpsichord). 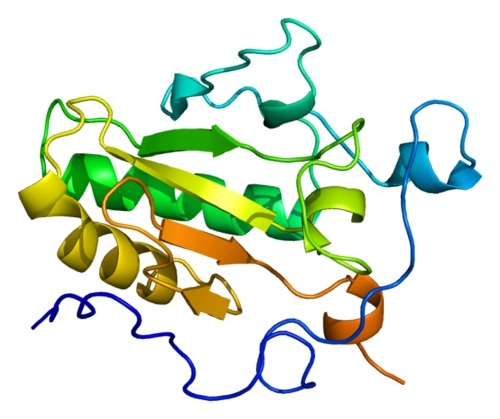 The chain of amino acids which forms ubiquitin is 76 molecules long; each is translated to a bar of music, which together form larger structures including alpha helixes (canons), beta sheets (driving arpeggios), and random coil (free fantasias). Ubiquitin is dedicated to the amazing Gloria Cheng. Premiere: 29 July 2012, Baltimore, Maryland. Pictures on Silence, Noah Getz and Jacqueline Pollauf. "...here's a piece I've just written that will appeal to today's taste; it may even have some success, if it finds a publisher." "What are you calling it?" "After Thilorier--a Grand Fantasy on the Liquefication of Carbonic Acid." "You can't be serious!" Michel exclaimed. "Listen and judge for yourselves," Quinsonnas replied. He sat down at the piano, or rather he flung himself at it. Under his fingers, under his hands, under his elbows, the wretched instrument produced impossible sounds; notes collided and crackled like hailstones. No melody, no rhythm! The artist had undertaken to portray the final experiment which had cost Thilorier his life. "There!" he exclaimed. "Did you hear that? Now do you understand? Are you aware of the great chemist's experiment? Have you been taken into his laboratory? Do you feel how the carbonic acid is separated out? Here we have a pressure of four hundred ninety-five atmospheres! The cylinder is turning--watch out! watch out! The machine is going to explode! Take cover!" And with a blow of his fist capable of splintering the ivory keys, Quinsonnas reproduced the explosion. "Whew!" he said, "isn't that imitative enough--isn't that beautiful?" This updated idea of program music appeals to me, not only for its wacky humor, but also as a possibility of what 21st century music may accomplish--the idea of sonification as an updated version of program music. As a kind of musical experiment I've attempted to represent the molecular structure of insulin in a new piece for the duo Pictures on Silence. Each amino acid is given its own musical motif, based on its structure, energy cost, molecular weight, etc. The sequence begins: MALWMRLLPLLALWGPDPAAA. 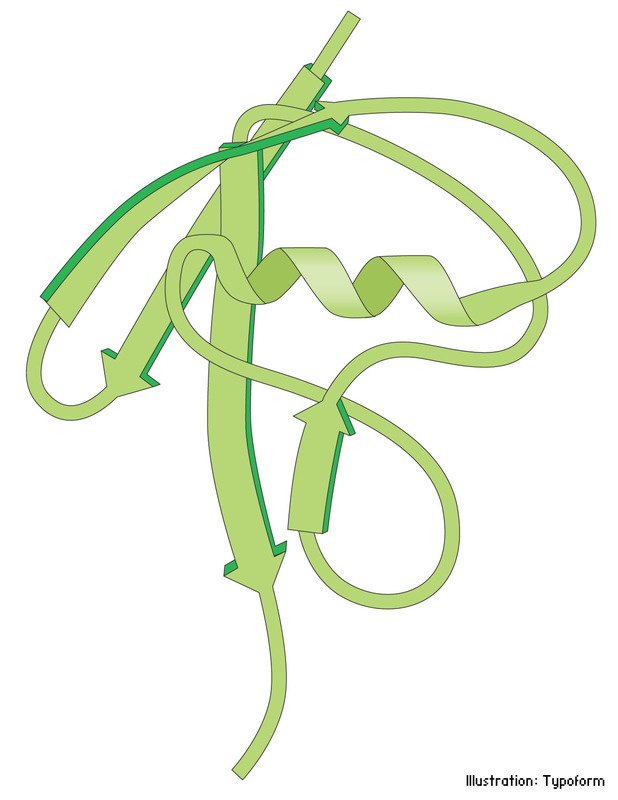 This is the signal peptide, or the first part of the protein; four other brief sections follow, alternating between coiled alpha helices (represented by canons) and straighter chains. Last updated June 20, 2018 by Stephen Taylor, staylor7@illinois.edu.